There are a few improvements to the keyboard, including the elimination of the trackball and a matte black finish. HTPC junkies are always on the quest for the perfect way to control their setup. There are a lot of options - from wireless keyboards, handheld remotes, motion control mice and more. 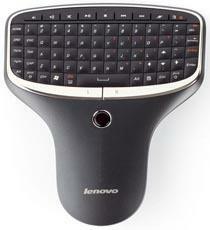 It's all based on personal preference of course Lenovo's multimedia remotes have always fared well. The company's newest update to their remote features a few improvements that fans have been asking for. To start with, you won't have that glossy black finish anymore - a nice matte black one is in its place. The trackball is gone as well, replaced with an optical pointer and scrollbar. Those fumbling in the dark to try and find the right keys will be happy to know that the latest iteration of Lenovo's remote features backlit keys as well. Lenovo's new remote runs $79 when purchased directly from the company and is expected to ship October 14th.